Begin your week with Wendy live from our studio in Golden Bay. Get your local focused news and weather for across the top of the South Island. This is a real community show for all of our communities. A wonderful variety of uplifting tunes - don't be surprised if you acquire happy feet and find yourself dancing along. Each show we have interesting guests from every walk of life and background, covering a broad range of topics. On today's show we are joined by Karen Huaki-Feaver from the North Island who has become a regular visitor to Golden Bay over the last few years. Karen shares some of her stories and views. President of the Golden Bay RSA Association Noel Baigent is in the studio to speak about the upcoming Anzac Day Services and parades. Mondays on Fresh FM are fun, bubbly, informative and filled with great music. On the show today NZ musician Finn Andrews (of The Veils) speaks with us about his solo tour and the release of his debut album. Takaka Primary School Principal Jenny Bennett speaks about what's been happening for the school children during term one and what's coming up in term two. Get your local news and weather and let Wendy help you begin your week. Begin your week with Wendy and special guest co-host Abbie Wilson-James our youth host of The Jam as they start the day with music and what's happening around the top of the south. Joining them on the show is Callum O'Leary President of the Motueka Waka Ama Club. Nelson poet Lindsay Pope reads a poem live on air. International circus and fire performer Claire French is in the studio to chat about the Marama Toa Women's Retreat. Begin your week with local news and weather as Wendy comes to you live from our studio in Golden Bay. Find out what's on around the region during the week and keep up to date with your community. On today's show Victoria University Geologist and researcher Theo Calkin speaks about his work around the top of the South Island over summer and lets us know what Geotrip is. All of that and a great mix of music - a little something for everyone. Grant and Wendy begin your week with local news, weather and music. They are joined by Chairperson of the community board in Golden Bay, Abbie Langford who will be speaking about the upcoming Tata Cardboard Boat Race happening this weekend. Golden Bay High School Principal Linda Tame speaks with Fresh Start Monday about the upcoming 2019 school year and the exciting news of the schools $20 million upgrade. Grant and Wendy begin your Monday morning with news, weather and music. Joining us in the studio is conservation extraordinaire and Chairperson of the Golden Bay Museum Geoff Renison. We have a special guest from Australia, eight year old Molly Wegner who tells us about what she thinks of New Zealand and Golden Bay on her first trip to our country. Molly is joined in the studio by her mum and long time dedicated listener of Fresh FM - Lou All-White. Grant and Wendy start your Monday off with news, weather and a great mix of music. Live from our Golden Bay studio, begin your week with Wendy. Local news, weather, what's on across the region, awesome guests and a great mix of music. President of the Onetahua Waka Ama club Steve du Feu speaks about the recent medal haul of members at local competitions. After another successful course run by the Sustainable Living Centre in Takaka, Murray joins us on the show to recap the weekend. Live from Golden Bay Wendy joins you to start your day with local news, weather and a fab mix of music. On the show today Daryl Wilkins speaks about the reopening of the Kaituna Track in the Kahurangi National Park. NZ National Treasure performer extraordinaire Ali Harper joins Wendy ahead of her show Legendary Divas in Nelson. Listen in for all of the latest updates regarding the Nelson Fires. 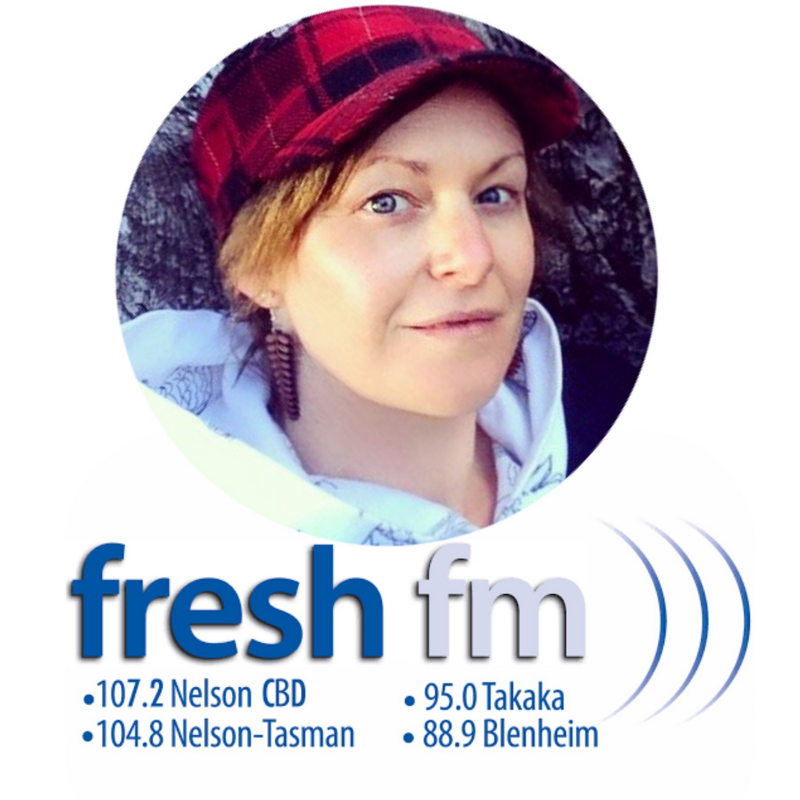 Wendy has your local news, weather, a great mix of music and is joined on the show by New Zealand electro dub band MC and saxophone player Saximus ahead of their gig at Tahuna Roots Festival. Josh Barclay of LegaSea NZ speaks with us about what it is Legasea do and how they are improving the marine environment and ensuring an abundance of fish for future generations. Golden Bay locals Andy Williams owner of Ellis Creek Farm and Georgie Moleta our only female dual butcher in the area speaks about what it is like to be a butcher and their exciting new collaboration. Begin your week with Wendy live from our studio in Golden Bay. On today's show we feature the free youth concert Rock The Bay. Paul McConachie from Youth and Community Works tells us all about the gig. 14 year old Golden Bay High School student Stella Molloy performs live for us two songs, one written last week for the victims of the Christchurch shootings. Wendy has whats on around the top of the south during the week and has your local news, weather & a brilliant mix of music to start your day off with a smile and a heart full of love.